3. Click on 'Run' to start the installation. 4. Click on 'Yes' to confirm that you want to go ahead with the installation. 5. Click on 'Next' to continue with the installation. 7. 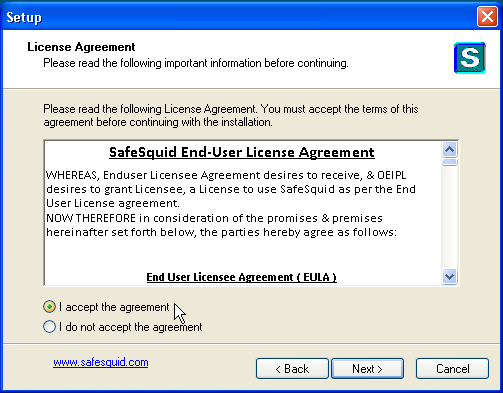 An EULA is displayed. Select 'I accept the agreement' and click on 'Next' to continue. 8. 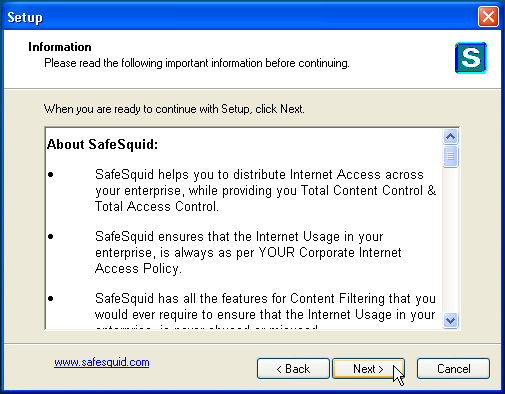 An information document on SafeSquid is displayed. Click on 'Next' to continue. 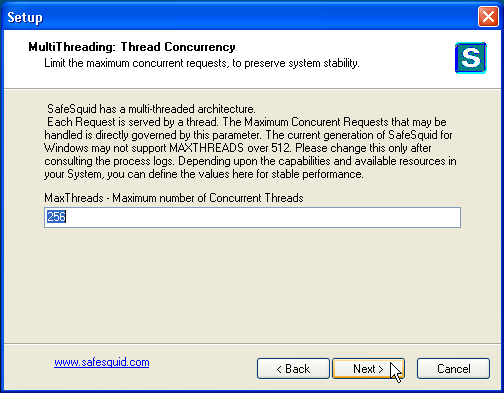 Select this option to complete the installation without entering any information for the moment. Once you have completed the installation, you will have to manually activate the product, before you can start using it. The procedure to manually activate the product is explained on this page. 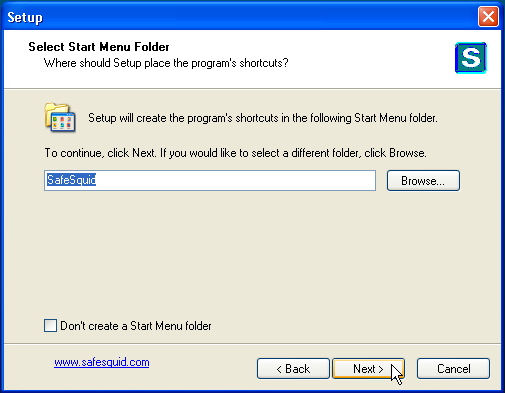 This option gets selected by default, if you run setup on a machine that already has SafeSquid installed. When this option is selected, the Key with which your existing setup is activated, is displayed. Leave this option selected, and do not make any changes, if you are upgrading an existing setup. If you are installing SafeSquid for the first time, you can enter any alphanumeric string in the 'Activation key' field. 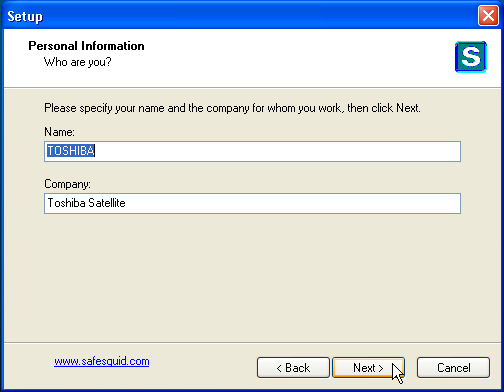 For example, you could enter you full name (My_Full_Name) or your company name (My_Company_Name). Enter something that is easy to remember. Enter your Email ID as security key in the 'Security EmailID' field. The Email ID that you enter here, will be permanently associated with your Activation Key. 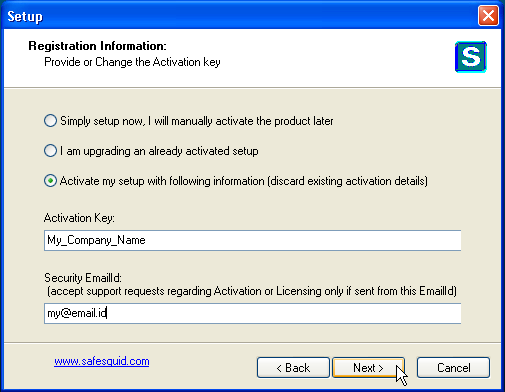 All requests for any actions on the activation key that you enter here, will only be accepted from this Email ID. This Email ID will also be required, if you would like to reinstall, or shift your installation to another machine. Select this option if you are reinstalling / upgrading your setup, and would like to replace the existing Activation Key. This could be required to change the Activation Key that you used for your trials, with a licensed Activation Key that you get after purchasing a license. NOTE: The rest of the installation is self-explanatory. If you are setting up a Stand-Alone or Master Server, you can simply keep on clicking 'Next' on each option to leave them at default value, and finish your installation. 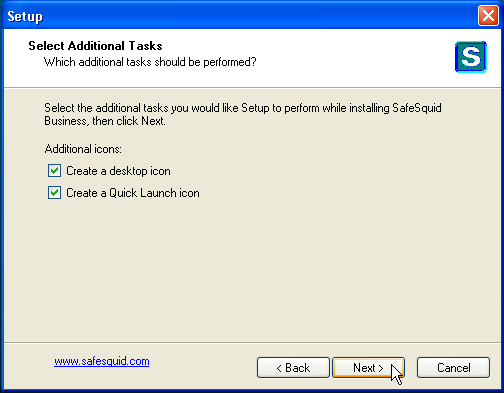 If you want, you can change any of the options later, from the SafeSquid Service Manager. If you are setting up a SafeSquid Slave Server to an existing Master Server (see Master-Slave Configuration), then pay attention to steps (16) and (17) below. 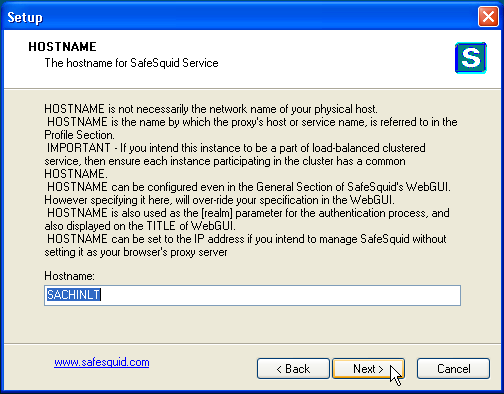 This option is only effective, if you are setting up a SafeSquid Slave Server to an existing SafeSquid Master Server. If you are setting up a stand-alone server, ignore this option and click 'Next' to continue. If you are setting up a SafeSquid Slave Server to an existing SafeSquid Master Server (see Master-Slave Configuration), specify the synchronization time interval (in seconds) after which this slave should synchronize configuration from the Master Server. 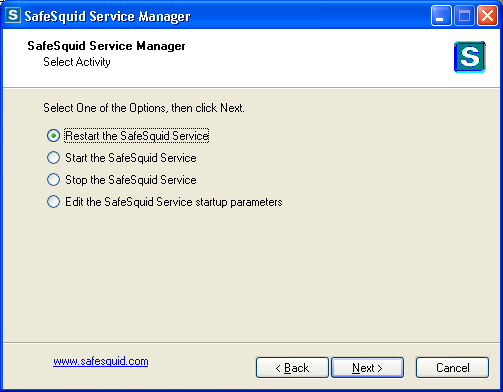 This option is only effective, if you are setting up a SafeSquid Slave Server to an existing SafeSquid Master Server. If you are setting up a stand-alone server, ignore this option (leave it blank) and click 'Next' to continue. 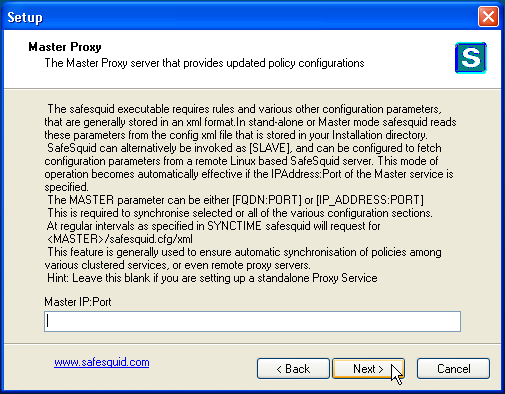 If you are setting up a SafeSquid Slave Server to an existing SafeSquid Master Server (see Master-Slave Configuration), specify either FQDN:PORT or IP:PORT of the Master Server, on which Master SafeSquid Server is listening, to synchronize configuration from the Master Server. 18. Changing this option could effect performance. Click 'Next' to continue with default value (Recommended). 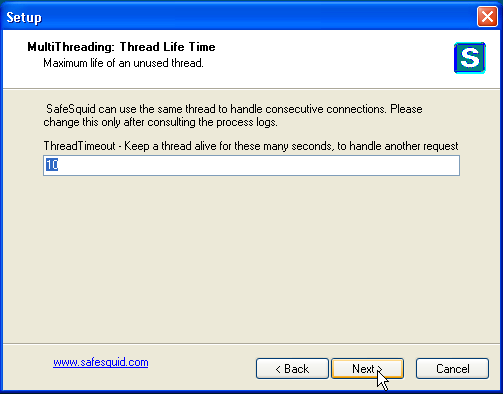 (Advanced Users - see Tuning Up SafeSquid For Best Results). 19. Changing this option could effect performance. Click 'Next' to continue with default value (Recommended). 20. Changing this option could effect performance. Click 'Next' to continue with default value (Recommended). 21. Changing this option could effect performance. Click 'Next' to continue with default value (Recommended). 22. Changing this option could effect performance. Click 'Next' to continue with default value (Recommended). 23. Changing this option could effect performance. Click 'Next' to continue with default value (Recommended). 24. 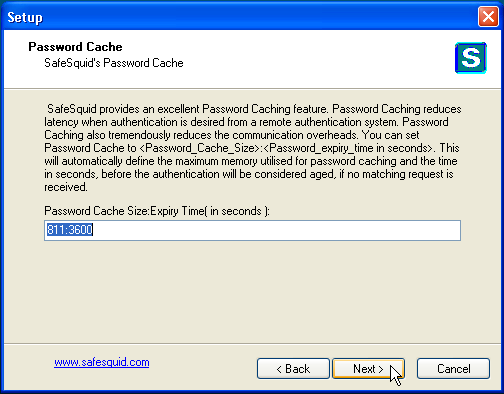 Specify password cache size and time (in seconds) if you plan to enable user authentication from an ADS / LDAP server. Click 'Next' to continue with default settings. 25. 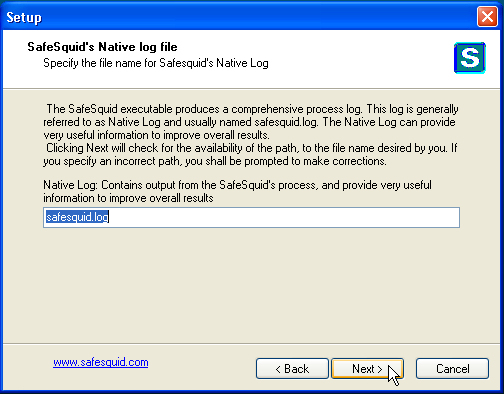 Specify the desired name of SafeSquid Native Log file. Blank this field if you do not want SafeSquid to generate this log. Click 'Next' to continue with default name. 26. 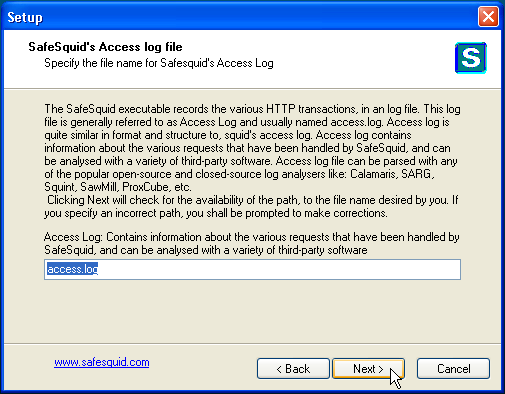 Specify the desired name of SafeSquid Access Log file. Blank this field if you do not want SafeSquid to generate this log. Click 'Next' to continue with default name. 27. 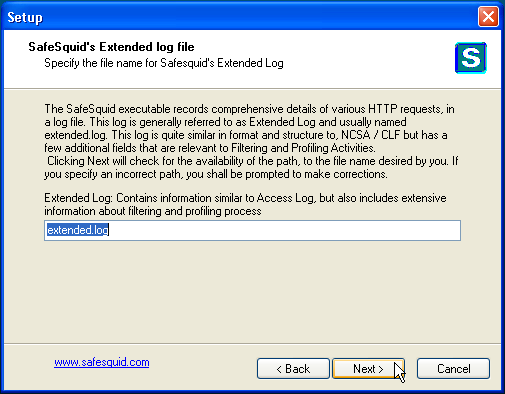 Specify the desired name of SafeSquid Extended Log file. 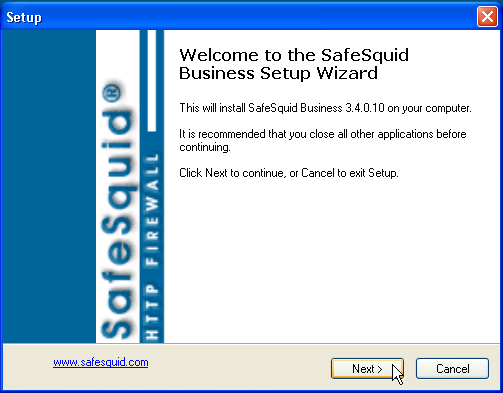 Blank this field if you do not want SafeSquid to generate this log. Click 'Next' to continue with default name. 28. 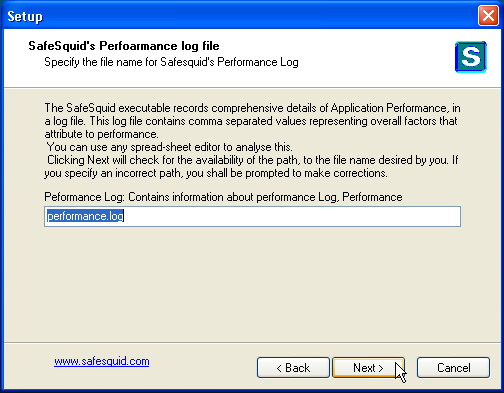 Specify the desired name of SafeSquid Performance Log file. Blank this field if you do not want SafeSquid to generate this log. Click 'Next' to continue with default name. 29. 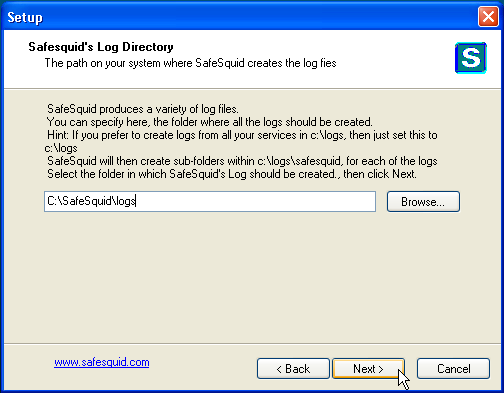 Select the entries that you would like SafeSquid Native Log to store. 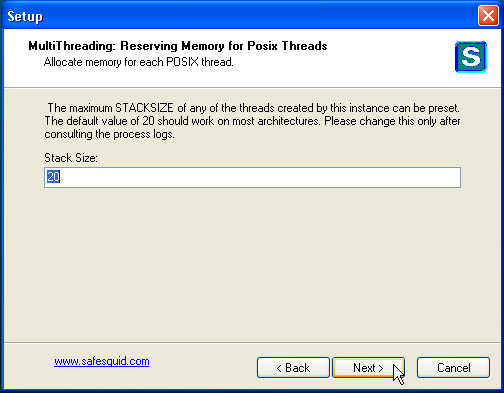 Selecting too many options could effect the size of the log file. Generally, the default selection should be enough. 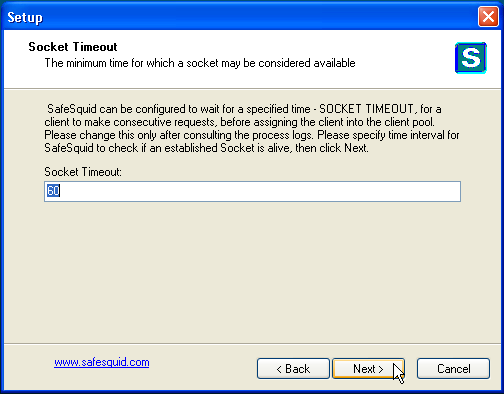 You can any time change the selection from the SafeSquid Service Manager. 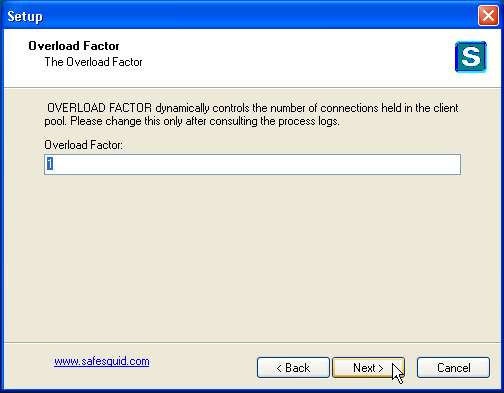 You might only need to select other option, if you are having problems with any of the above options, and would like to trace the problem from the SafeSquid Native Log. Click on 'Next' to continue with default selections. 30. Select whether you would like the setup to create a Desktop Icon and a Quick Launch Icon. Click on 'Next' to continue. 31. Your preferred settings are displayed for you review. If you would like to change any of the settings, you can click 'Back' and navigate to option screen, make changes, and come back here. 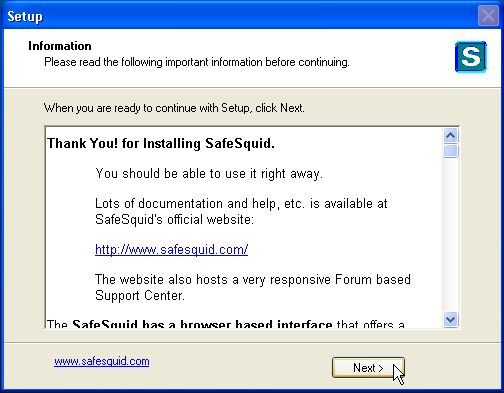 Clicking 'Install' will install SafeSquid with the displayed settings. 32. After the installation is done, an information page is displayed for your reference. Click 'Next' to continue. 33. 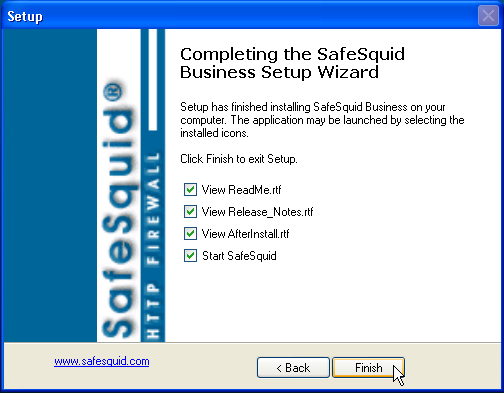 Select if you would like to go through the Readme, Release Notes and After Install documents, and if you would like to start SafeSquid Service. 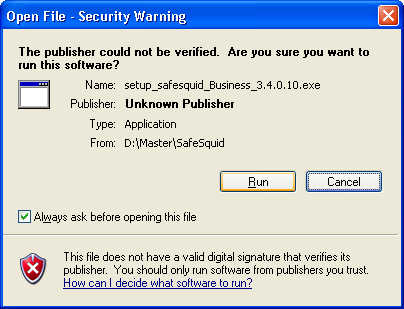 You can always refer to these documents later from the SafeSquid Program folder at Program Files > SafeSquid. 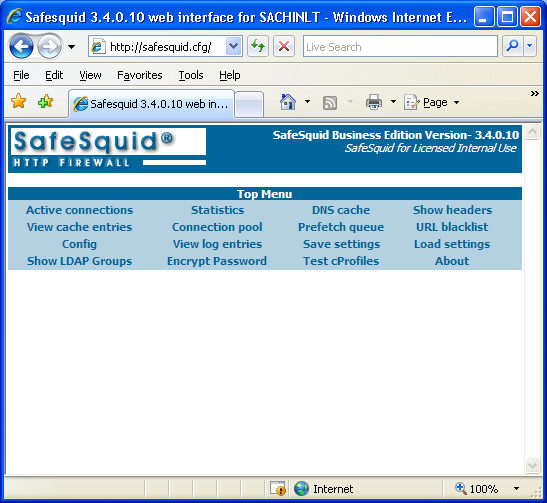 Once the installation is done, and the SafeSquid service started, you can access the SafeSquid Management Interface from any browser. 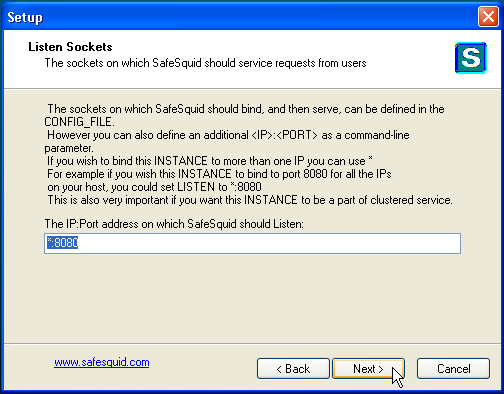 To access the interface, set proxy in the browser to the IP Address / HOSTNAME of the system on which SafeSquid is installed and the port on which it is configured to listen on, in (14) above (default - all IP addresses and port 8080). 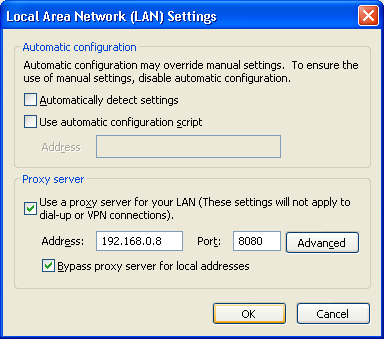 For example, in Internet Explorer, go to Tools » Internet Options » Connections » LAN Settings » Select 'Use a proxy server for your LAN' and enter the IP address and port on which SafeSquid is listening. 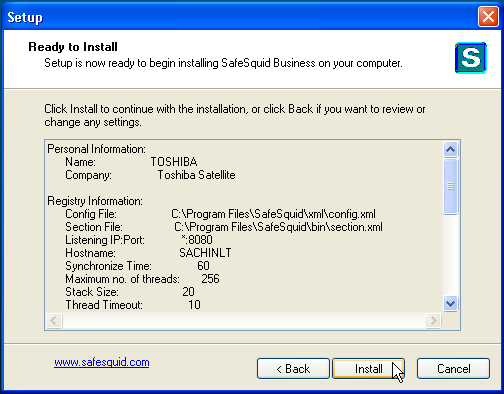 SafeSquid Service Manager can be accessed from the Quick Launch Bar (if you opted for it in 30 above), or from Programs > SafeSquid > SafeSquid Service Manager. 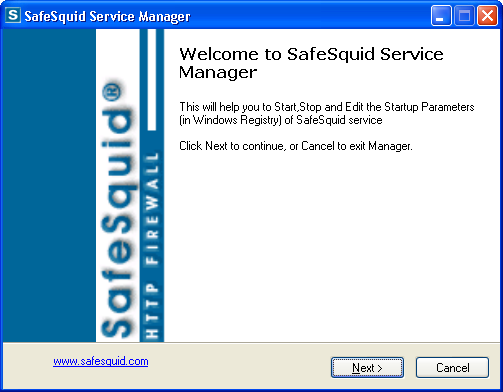 You can use SafeSquid Service Manager to start, stop or restart SafeSquid service, or to modify the startup parameters that you selected during the installation.